Yikes! I have officially been a WA member for 8 years! I was up late and looking for a solution on the internet about how to improve my SEO skills and learn how I can make money online. After a plethora a searching, Wealthy Affiliate landed on my lap and the magic of their sales letter convinced me that I’d give it a try. The information and tools (even way back then) were awesome. There was a very supportive community (via a forum) who would gladly answer any question regardless of how silly you thought it was. With stars (and dollar signs) in my eyes, I thought with my existing web/graphic design background I would build an elaborate network of websites called ‘InfoAboutEverything.com’ where I would build a bunch of websites that would essentially link to each other and I’d make a bunch a of money. Of course I would run it by Carson to see what he thought about my elaborate plan of attack to make my millions and was honestly anticipating the green light from the WA owners. Carson thought overall my plan was extensive and applauded me for my eagerness, but gave me a reality check on how much time that would take and how ‘thin’ the concept was. So I took Carson’s advice and started with just one site. And I am VERY thankful that I followed that advice because that site is still a great success! It had been one month since I joined WA and was really enjoying the support and tools. Then one day, I was at Costco doing my typical mass quantity shopping, I had noticed someone across the isle who I recognized but just couldn’t put a name to the face. Then it dawned upon me that it was Carson from WA! It really caught me by surprise but I decided to approach him and introduce myself. We didn’t realize that we both lived in the same city and later through our conversation we were literally only a few minutes apart from each others’ houses. We spent the next 20 minutes talking shop (internet marketing) until Costco told us it was time to leave as they were closing. That meeting had a profound effect on me and really kick started my success. Why? Because it made me realize that Kyle & Carson were real people that truly cared about their members regardless of how close or far away they lived. Shortly after bumping into Carson at Costco, I had the opportunity to meet with Kyle (who also lived within the same city) and Carson for coffee. This ended up becoming a regular thing and we would talk about business including the state of the online marketing industry and how it could be improved. I felt privilege to be included in these conversations and was absorbing the info like a sponge. One of those coffee shop meetings, I mentioned that I was once involved in radio and how comfortable I was in front of an audience and microphone. And with Kyle & Carson’s entrepreneurial minds, they felt compelled to leverage this talent. We had all noticed that the online marketing industry had JUST started doing webinars but all of them had some sort of upsell at the end and really offered no value. It was decided to start regular online live training sessions that offered pure training and never any upsell opportunities. To this day, the WAbinars still hold this prestigious value. Even though I have been here for an entire 8 years, I have no plan to leave WA anytime soon. I have a personal mantra to help you in the same manner how Kyle and Carson have helped me achieve success. And we may not live within the same city, I like to consider you a neighbour when you attend the live training sessions. So, please raise a glass and help me celebrate being a WA member for 8 years! And cheers to YOU for taking the time to read this and being involved within the WA community! I hope to read your WAnniversay post soon! I remember the Costo encounter like it was yesterday and I even remember the isle that we were in when I heard this unfamiliar voice call my name! It was really by chance that we met that day and it's one of those encounters where things wouldn't be the same if it hadn't have happened. I don't think it was more than a few minutes (as I left Costco) before I called Kyle to told him that I had met "Magistudios"! Then it was the first Serious coffee meeting, then the second, then the ???th!! The birth of the WAbinar was awesome and look how it's turned out over these years. Friday nights with JAY (and his wit), talking about everything under the sun related to Internet marketing, building an online biz, and leveraging the platform at WA. It's been an incredible relationship that has literally helped thousands of people - you rock! You mentioned your initial idea for creating the site about everything, and doing the crazy linking strategy thing... To this very day I would answer you in the exact same way. Focus on one thing, focus on something simple, and grow it into whatever you want. It's like constructing a high-rise building. You always want to start with a solid foundation. The foundation isn't fancy...it's just concrete and solid so that it can support every floor all the way up to the penthouse! Fundamentals of marketing and building an online biz have not changed, nor have the fundamentals of how Kyle and I teach folks to get started. Of course you just had to dig up the old website didn't you!?! Thanks for all you do here at WA, thanks for being so helpful and always willing to lend a hand to members just getting started, and thanks for yelling at me in Costo that day, life (and WA) wouldn't be the same without you! Here's to another 8 bro! truly an inspiration for us all. I too have/had a infoabouteverything.com mentality until now and I am going to now really pray and think about what 1 site to build. I just got a huge lesson from Jay tonight, along with LabMan, that echo the importance of reining in my ideas to one site at a time. You all are timeless examples of wisdom as Co-evidence as I like to call it. No such thing as coincidence in my world. Thank you all for calling me to my rightful place! So now it is 10 years an still drinking coffee with Kyle and Carson while keeping the Friday night program going. You know you might be setting a few records for the longest running WAbinar on the Internet already. Really enjoyed this. Feeling more confident with my decision to choose WA. I have to tell you all that Jay is the reason I am here at WA! While doing some research on a uh .. lower quality internet marketing approach, I happened to come across a comparison review of that marketing system vs WA. Jay was clear, clean, and concise in his review and a link on that page lead me to WA! Thanks Jay for taking the high road and delivering a realistic review that helped me to make the appropriate decision! Well what a gem of a find. Now you can get your business honed with the only resources worth investing in, right here. Welcome to WA and wow, I look forward to what you will creatively bubble to the surface. Thanks Linda! And thanks for the follow. I look forward to hearing of your continued success as well! Wonderful & inspiring profile read, and that "Chance Meeting" story is such a fantastic one. I really, really enjoyed that read. ReSpEcT! Sometimes words don't say what we'd like to convey, because we can be at a loss for words. One thing is for sure though, it is wonderful to get to know you better through your anniversary post and to see a bit more of the history of this organization that I have come to so appreciate! My Fridays are often a mess with kids and the therapies that my youngest special needs child receives here in our home. I am thankful that I can watch the session after you post it around 24 hours later. Please know I am just one more person here who appreciates you and how you support me/us in this journey to learn what works in developing our websites. Every day and in ever way I do keep at this, sometimes and starts and stops and stalls around family needs but ever plugging away. They were millionaires at 25? That's the first time I have ever read anything about money...I should have assumed that. Wow what an experience and a way to get started! No wonder you are still here, to meet the masterminds of this great business so early and get that 'in real life' inspiration must have been mind blowing. I have only been here for just shy of 3 months, and already know that I too hope to be here for a long time! Congratulations on your success. Thank you for being an inspiration. And....just for the record, after Kyle and Carson, I consider you to be the next best, as you do really live into your personal mantra of helping in the same way. I am yet to get to a live training session as my children have Saturday sport (in my time zone that is when you are on) but I am aspiring. wow what a journey over 8 years. sometimes things just happen and we look back over time and see them as defining moments in our life's.Thanks for sharing your journey so far. Wow, magistudios, it was meant to be! Eight years is a good testament! I've been here about a 1 1/2 years and really enjoy it. Have created 6 sites to date and still going and learning! You even created a skating product which I think is awesome! Thank you! That's what I started with! Was I crazy or what?! Talk about learning curve! Love this stuff though! Thanks for sharing, beautiful story! Just incredible to be a part of all this in my teeny weeny way. Wish I'd just got on with it when I first put my nose in back in 2010 - felt it was something special, but as usual I didn't have enough faith in myself. So glad I received the email from Kyle last year inviting me back in, and no stopping me now, either. My website is slowly taking shape, and its main function will be to shout about WA to every corner of the globe, because I just love what WA is and does - so all-embracing and a shining light for the way forward online in a rapidly changing world full of tricks and traps. Being here at WA was fate Jay. You were just meant to be here as part of a great team. Thank you for all that you have done to help WA'ers over the years. And I hope you enjoy your trip down memory lane for many years to come. By the way, wonderful news to know that your health is back on track and that you are feeling so much better. What a wonderful story. Three noble souls and top talents congregate in wa and the friendship last long .... I feel so lucky to be here. You are the greatest. Thanks for sharing the encounter. I also thank you for the weekly training you provide. I have been a member of the community for 2 months today and I have tuned into every weekly session. I admit much of the information is FAR over my head, but I look forward to the day it all make sense. I have live a fairly successful life for the past 72 years and I learned, “IF YOU WANT TO BE SUCCESSFULL HANG WITH SUCCESSFULL PEOPLE, HAVE THOUGHTS THAT SUCCESSFULL PEOPLE HAVE AND DO WHAT SUCCESSFUL PEOPLE DO." and you to will be successful. I have no doubt, my association with the WA community and people like; you Kyle and Carson will result in more success and I look forward to the journey. I have told friends of mine that studying here at WA is much more than the equivalent of a masters degree in IT. It more like a degree in Business, Marketing, Advertising, as well as IT. Much of my enthusiasm over this platform has come from the video training that is provided by Jay. It is done with such simplicity and tongue in cheek type of attitude that it makes it much more enjoyable than any schooling I have ever been a part of. I have only been around for less than 2 months and have only viewed a few more than the number of weeks that I have been here but it is such timely information done in a way that makes understanding so easy. Keep up the good work and best wishes. I couldn't agree more Keith! I joined WA in 2008 so I've known you for some time. You are a great asset to all of us. I don't always get to your Webinars even though Carson always reminds me (and all members) of them and I sign-up. The reason I'm not always there is that I'm just too damned old to remember. Also, I don't watch the clock. But I always go back and watch the reruns. When I want to know some knitty gritty, I go to your past Webinars and learn the tricks. It scared the hell our me when you were ill and in the hospital for so long. I continually prayed for your recovery and for your family. I can still hear a bit of trauma in your voice. You must have had a tube down your mouth for a long time. I have not completely recovered from such an experience from a year ago, nor will I.
I am so happy with knowing you and more than happy with your recovery. Great to have you back and God Bless You and Yours! Well, it will be a while before I celebrate my 8 yr anniversary, but I hope to do so with as much honesty and grace as you have. I don't believe in coincidences so I think that you, Kyle and Carson were meant to meet and the WAbinars are extremely helpful because of that union. Congratulations on your 8 years and here is to many, many more! I signed up to his Bum Marketing Method back in 2008, and first heard about WA through his list. But I didn't sign up until 2009, possibly via PotPieGirl, but I'm not entirely sure. I remember being tempted to join Travis's gig - glad now I didn't. Congratulations on yr 8th year anniversary, Jay!! Wow!! Ah Jay, congratulations on 8 years at WA. Magistudios provide the human touch (verbal) to WA learning. ..and your lessons are so clear and (WHOOSH)..actionable. I want to congratulate you on your 8th anniversary with WA. Every time I think I know how to do this you come out with a video showing a better way. I am indebted to you all, Jay, Carson and Kyle! Thank you gentleman for continuing what ya'll started 8 years ago. I am honored in knowing of you. Jay, Congratulations on your 8th Year Anniversary. I always enjoy your Webinars. I think you are a great teacher and speaker. I look forward to attending more live Webinars in the future. Your story is so inspiring. Here's to your happiness, good health and success for many more years! Wow great story magistudios, i can't wait to be in your shoes 8 years down the line. Thanks for the motivation. Very motivating! Thanks for sharing! Jay! Stories like these are so motivating and inspiring! I'm glad to be here at WA and although I haven't focused much on it, I know it's one of the BEST places online. I don't plan on leaving anytime soon either, but I do plan on becoming more active with the community and working on ALL the training. Kyle, Carson and you are the REAL DEAL. Thanks for your story Jay! Wow! I've only been here 2 months, but I know this is the place to be. So much honesty in you, Carson and Kyle. Really helping people because it is the right thing to do. Thanks so much! WA would be the the same without you and the webinars Jay. Congrats on 8 years! Oh Jay, it is so lovely that you have written this story and what a special reply from Carson, awww! I love your wabinars and have learnt soooo much from you. I'm relieved you are staying with WA. Keep up the great work and, for goodness sake, stay well. Happy Anniversary Jay and thank you for all you do! This is an amazing story and so encouraging. What date did WA start? I want to put it in my diary and celebrate it every year and of course the day I joined. Thanks for sharing your experience, though I where I am is far far away yet I do think WA is a great place. Anyway cheers to you and see you around. Happy anniversary!Thanks for sharing an inspiring story. Congratulations Jay I am a beginner here and finding my way thanks to you too ! Really enjoyed reading your story and Happy Anniversary. I haven't been here a year yet, but almost. Love the Flintstone video. I remember that episode. lol. Congratulations Jay. Was that luck or divine intervention? Congratulations!! Hope to one day be blogging about my successful WA anniversaries as well! Congratulations on making 8 years Jay, I have only been with WA for 3 months now and already I have learned so much from you. I love tuning in to your weekly WAbinars, when I can. I am working on your homework, slowly, but surely. Can't wait to see what you will teach us next. Your efforts are definitely appreciated. Congratulations. Thanks for sharing this inspirational story of yours. This is what makes all the difference. People like yourself, Kyle and Carson. I feel very fortunate to be part of the WA family and am looking forward to many more trainings. Thank you for all your effort and staying on board for the rest of us!! It is always good to read or hear a success story. Thank you for the inspiration. All the best for the future WA is a winner. We are so lucky to have such a team here at WA, sharing their knowledge and guidance… Kyle, Carson and You… What a trio!! Happy #8! and thank you for all that you do for so many… Best of all, you always do it with a smile. Congrats Jay. It's an honor and a blessing to have you giving us in dept training through the Wabiners. Thank you for your years of service! Great Flinstone video. My desktop is the Flinstones. Happy Aniversary. Thanks for your interesting story & all the things you have taught me on your Friday night live training sessions. Actually, it's the only webinar I've ever attended that doesn't try to sell me something. I didn't think webinars like these existed until I came to WA. to Friday night with Jay. To your good health my friend. Congrats on the 8 years and thanks for the awesome WAbinars and advice! I felt there was something different about the end of the first WAbinar I saw compared to other IM webinars I had watched but couldn't put my finger on it. Reading this it's now it's clicked - no upsells! That was the very first WA-binar,( and not recorded for posterity) I was sad to see the term retired last year when the menu item was changed to Live Video Classes. I was new to all of this stuff back then and decided to give it a try anyway. I think the topic was html stuff. I know my brain reached saturation quite quickly. You all had a good laugh when I said my brain was full. Since then, I've been very glad to know you. I know my life is better for the relationship. Although we have never met in real life, the countless hours online make it seem so. Happy Anniversary Jay, and what a great experience you had! I went to my first live WAbinar this last Friday the 20th and it was phenomenal on all counts - and I've hosted hundreds myself - you're was bar none! I absolutely LOVE your phrase 'great minds travel in the same frequencies' and can tell you that I will use that from time to time. Wow, 8 years already. I still to this day remember those early meetings and getting to know the guy that we have come to know as nothing short of Jaymazing! Thanks for being an instrumental part of the WA community for the last 8 years and I really do look forward to what the 8 next years will bring. I know it will be hard to top the last 8, but it can be done! Your WAbinars are such a prolific extension of the WA Training Platform. You cover the topics is such detail and depth. If you compare completing the Certification and Bootcamp training to a bachelors degree, completing all the WAbinars is like getting a masters degree. Thanks, Jay ... sure glad to here that you have no plans to leave the community. Congratulations Jay. I have only done 2 of your training's but already learning so much. Thank you. Hi Jay, I enjoyed your story! Thanks for sharing. 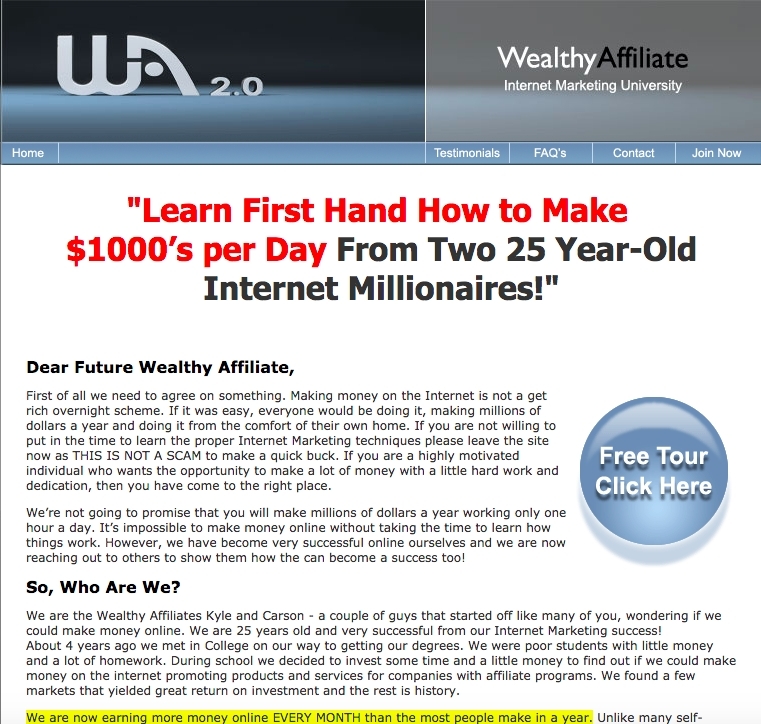 I see myself going the long run with internet marketing and because it is ever evolving, I see me staying with WA for quite some time as well! I really enjoy learning the material here and sharing thoughts and ideas on WA! Thanks for all that you do! Hooray Jay! This sounds awesome! I can't wait for my 8th year with WA! Congratulations magistudios, funny video, takes me back. What I wouldn't give to have coffee with you guys and talk shop. I guess I need to get going on making it to Vegas! Thank you for sharing that, i too tend to have the same dream of many websites all making me a fortune, i can not seem to even get a good grasp on one yet,but it will come,.in the meantime i am learning everyday here. I just watched your webinar last night. Is a webinar sorta the same thing as video reviews?That is what I do on Amazon. Brilliant success story Jay. Congratulations on your 8 year Anniversary wishing you many, many more happy years at WA :). Congratulations! Great story. Thank you for sharing as it's very inspiring. Great Story! I know that it takes time to build a profitable online business. So, hopefully you get to read my 8 year anniversary success story...of course, that is still a few years away!! Thanks for sharing!! Thank you for this article. It is exceptional, because you are an example how to reach heights here in WA. You let me to participate in your journey through moments, described here. You show me, what nothing unnatural is here, just decent work and perseverance. All the best, happy anniversary. What a great post Jay, congratulations and thanks for paying it forward.You do an awesome job teaching with the WAbinars...sure helps me, thanks again and may you have another eight years at least! WAy cool....love the Flintstone clip. Thank you for your contributions in helping to lead the way for so many of us. Your constant support and training have certainly shown everyone what it means to "pay it forward". Jay, eight wonderful years with a fantastic business model. You are indeed a very fortunate man. Congrats my friend. Thank you for the time you share with all the WAers. Your trainings are great, we all appreciate you. My class is lifted high to toast you and WA. Awesome! Many more wonderful and productive years ahead, Cheers! So glad you make that chance?? meeting with Carson. Happy anniversary Jay! That is a awesome success story and congratulations, I can't wait to have my own some time in the future. HAPPY WAnniversay so glad we have you on the team. I hope to be as much of an asset as you here at WA. Congrats Jay! Thanks for this. Wishing you continued MASSIVE success!! Wonderful story and congratulations on your 8 year anniversary with WA. I enjoyed your story and it sure gives hope to those of us that just started. Thanks again for your support! I love this post. I really give us newbies hope that we can be successful at WA. Congratulations on 8 years! Time sure flies by when you are having fun! Thanks for your story because I have always wondered how the WAbinars got started. Thanks for including the screenshot of the ad you responded to. I like looking back into the past. Though I have yet to sit in on one of your live classes, too busy at the time it airs, I have watched many posted training and have learned much. If there ever was a 4th Musketeer within WA, it would have to be you Jay - Kyle, Carson, The Members and you - Nice Story! Thanks Jay. I have always thought that people who remained long time members just HAD to be successful! And I have found that it all depends on the definition of success. But it seems like all that I have had contact with are pretty happy and content, and although I want to be financially successful, I truly want to be happy content! Your post is just another inspiration paver on my path. Thanks again! Fate for sure!! Great read! Many thanks! Congratulations Jay. Your story is amazing. I think that concentrate and be patient is a key to success. I'm for a long run with a WA and amazing WA community. This is the kind of blog we need to read as new WA members. It helps to keep us motivated. Thank you and congrats Jay! Congratulations Jay and a thousand thanks for your fantastic weekly Webinars, they really are brilliant. Do please keep up the great work. ... I sure am glad you happened to find WA too! It would not be the same without you - I usually cannot watch the WAbinars live, but I always watch the replays and what YOU have taught me is invaluable - and I Thank You! ps - you better stick around! This is just too cool! You've probably told the story a hundred times and it never gets old. I really enjoyed it, Jay! Thanks for posting your inspiring story! Wow Jay really inspiring and a true case of the Law of Attraction in action! You are a true asset to this community and I'm glad that Kyle and Carson knew this already 8 years ago. Your weekly WAbinars has helped so many people here and even though I never make it to watch them live (timezone difference), I definitely watch the replays and your recommended adjustments do make a difference in terms of rankings, traffic, etc. Thank you for being who you are. Thank you for hosting these very crucial training lessons every week and thank you for having no plans to leave WA. Thank you also for sharing your personal story with us. It means a lot and is very inspirational. To our SUCCESS in business and in LIFE. Hello Jay! Thanks for sharing your story with us. I really enjoy your Wabinars. It is great to have you here. Congratulations Jay and I really appreciate your excellent webinars when I can be there. 7-1/2 years from now, I want to be just like you. Thanks for this, it is inspiring. thats really inspiring and Amazing. Hello Jay, thanks for the history story, of course it will mean very much more to you. Yes and I can feel that you made a great connection on that first meeting with Carson. May I say a magic moment! for magistudios...? Will raise a glass of good Australian Barrossa Red for you! Hi Jay, congratulations on your anniversary of eight years with WA. Thanks also for the education from the WAbiners you make, they are greatly appreciated. Take care, Wayne. Hi Jay - I intend being here for a loonnnggg time too - but I love hearing about other people's stories, so thanks for posting. How wonderful hearing your story Jay, and that "coincidence" spotting Carson in Costco! Your WAbinars are always too late for me to attend live (UK), but the great thing is they are all there for me to watch anytime, I love them! Happy birthday to your daughter, Loes! Happy Birthday to your daughter Loes.